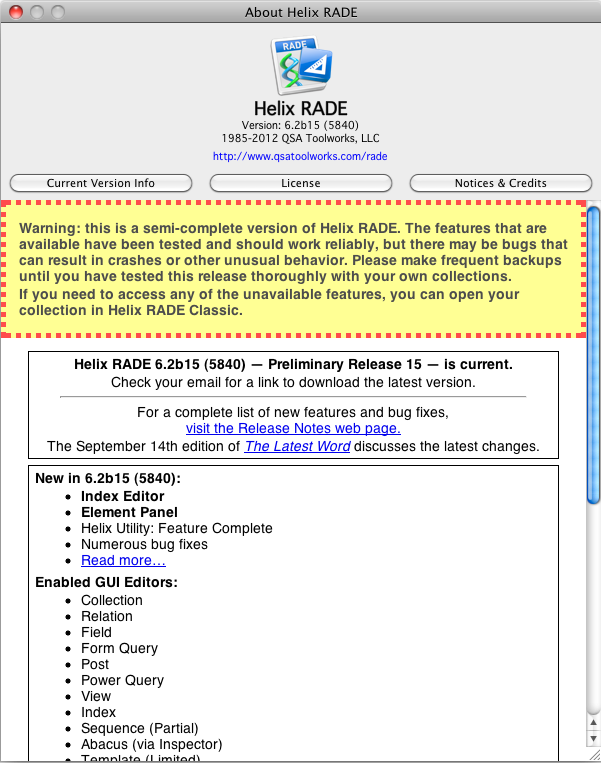 14 September 2012 — Excellent progress continues with the fifteenth Preliminary Release of Helix RADE 6.2 for macOS available today, four days behind schedule, but well worth the wait. We decided to hold this release up a few days specifically so we could thoroughly test our new feature. After the stumbles we had with the post icon editor, we did not want to subject you to a similarly unpleasant experience. To those of you with a monthly subscription to the Europa Pioneer Plan: the appropriate charge will appear on your credit card today. Remember, when we charge your card, we send an email containing a link to the latest update, so if you don’t receive that email today, please contact us right away. If you aren’t receiving those emails, perhaps your spam filter is working overtime, or maybe you didn’t respond to our emails and calls asking you to renew after your ‘year one’ subscription expired. Regardless of the reason, if you are not receiving monthly emails informing you of how to download the latest updates, please contact us so we can get you back in the game. For those out there who haven’t joined us yet, you can still join the monthly plan, for an initial payment of just $160.00, followed by 8 monthly payments of $40.00. Or you can pay $440.00 and get every update we release until May 31, 2013. We’re still committed to monthly releases, so that’s 8 more updates delivered to you automatically. The installation process remains the same: mount the installer disk image, drag the new Helix RADE onto the Applications folder and let go. 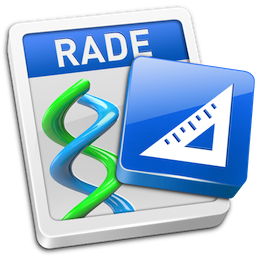 If you are updating from an earlier version of Europa, you can also double click the Install Update to quickly install the new version of Helix RADE. But to get the new version of Helix Utility, you must — one last time — open the “Helix Diagnostics” folder and drag Helix Utility to your Applications folder. Once you’ve done that, you can eject the disk image and go to work. The generally warm welcome that the new Intel-native Helix Utility has received from Helix users is a perfect example of the old adage that inside every cloud there is a silver lining. The cloud — that we had no Helix Utility that could run in Lion or Mountain Lion — has revealed its silver lining in an all-new, significantly enhanced rewrite, with a genuinely intuitive user interface. The new Helix Utility debuted two months ago, with just a few of the old functions working. It could check and repair collections, but that was about all. This month we give you a seriously updated version with all* of the functions of the old version up and running, thoroughly tested and ready to go. *The Apple events from Helix Utility 6.0 have not been implemented in Helix Utility 6.2, because the old commands do not make sense in the new utility. We will introduce the new AppleScript dictionary later this year. Every reported bug in Helix Utility has been fixed. The ability to break indexes and compress collections are back. Drag-and-drop works, and the ‘collection buffer’ preference has been replaced with an intelligent memory model that dynamically adjusts to assure that operations run as fast as possible without wasting system memory. We also tossed in a couple of enhancements, such as control-clicking on a name in the collection list to bring forth a contextual menu with genuinely useful actions, and linking functions that needed to be done in order together so they happen automatically and in the right sequence. And, of course, the prime directive of making sure users of Intel Macs running macOS 10.7 (Lion) and later have a Helix Utility they can use without having to keep an old machine around has been satisfied. Thus, the first piece of news for today is that rigorous testing with live systems has confirmed that this product is ready for prime time. This is not beta software. You can use this new utility without fear, even with your older versions of Helix that you run in your production environment. Normally Helix Utility is a ‘free’ program that anybody can download and use. It will be again one day, but between now and the completion of the Europa program, the new Helix Utility is available only to Europa Pioneers. This new version of Helix Utility also has an exciting new bonus: because it is a ‘Cocoa application’, we are able to take advantage of some of the new tools that are available. One of those tools is a ‘software update framework’ named Sparkle, which is used by hundreds of popular applications to deliver updates. And so, this new version of Helix Utility can automatically inform you when an upgrade is available and, if you so choose, install it with a single click. We did this for two reasons: first, every developer who uses Sparkle loves it, and we wanted to see if it was as wonderful (and easy to integrate) as they claim. On both counts, Sparkle is a winner. (It took us less than one day’s work to add it to Helix Utility.) The second reason is that we found instructions on how to make it work with Carbon applications (such as Helix RADE) so, if it works well for us with Helix Utility, we can incorporate it into the rest of the Helix family, making it all the easier for us to deliver — and you to get — future updates. With the exception of the aforementioned Apple events — which will be added soon — we are not planning to do much more work on Helix Utility, at least not until Helix RADE is much further along. But if we’ve learned one thing since this journey began, it is not to bet against unlikely events. But now you won’t have to wonder whether you’ve got the latest version of Helix Utility — it will let you know when there’s an update available. As we explained while rolling out the new AppleScript capabilities in Helix, Helix icons have two components that, for simplicity’s sake, we refer to as properties and elements. Properties are simple settings that can be managed directly in the Inspector window. But elements are more complex, and thus far we’ve been editing elements through dialogs that open from within the Inspector. 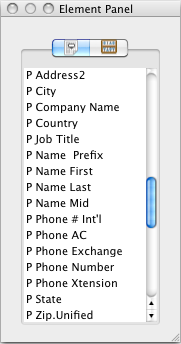 But dialogs are less than pleasant, and from the beginning, we knew that true Helix Design Mode bliss would come only when we could drag-and-drop Helix icons, like we do everywhere in Classic Helix RADE. The reason we postponed the index, sequence, template, abacus and user editors was because they all require this capability. But having the old “slot machines” in every one of those windows is not “the macOS way” of doing things, and we really wanted to create something new. Something better. In the last few editions of The Latest Word, we’ve been hinting that ‘something completely different’ was coming. Now it’s here. The first time you launch Helix RADE (after installing this update) and open a collection, the new Element Panel appears automatically, on the left edge of your screen. It’s a floating window, just like the Inspector window, that you can resize, move and open or close to suit your personal preferences. We also made sure that it remembers where you left it when you Quit Helix RADE, so it is restored to the size and position you prefer the next time you launch Helix RADE. Being a floating window, the Element Panel is not attached to any specific window. Instead, it is contextually-connected to whichever window is currently active. 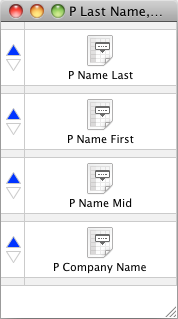 In Preliminary Release 15, its function is limited to working with the index window, but it will also support the sequence, template, abacus and user editors when they take their places in Design Mode. And because the Element Panel is not attached to another window, it can be resized to as tall and as wide as you prefer. No more cursing the narrow window that truncates any icon name longer than a dozen or so letters. The Element Panel is a more precise rendering of the original vision of how Helix was supposed to work. Instead of a panel attached to every window as they are in Classic, a single floating panel would adjust dynamically to whichever window is currently active. Back in 1984, the nascent Macintosh system software didn’t have the chops to pull it off, and we’ve been stuck with a panel affixed to every window ever since. The amount of screen space wasted by this duplication of information is really enormous, so, in re-inventing Helix we decided to fulfill the original vision. We’re really pleased with the result, and we think you will be too. When you open an index editor window — as you’ll see in a moment — the Element Panel shows tabs for the fields and abaci from the relation where that index resides. Creating this all-new interface element was not a trivial task, but now that it is in place, we have the foundation for the rest of the Helix icon editors. Next month (we hope) when you open a sequence editor window, those tabs will show the views, users, sequences and commands needed to build a sequence. By the time this journey ends, you will be well familiar with what the Element Panel does, and you’ll be hard pressed to remember what it was like to design an application in Helix without it. As they used to say on the old “Concentration” game show (1958-1973), with these pieces of the puzzle in place, can you tell us what the puzzle says? Yes, you can now open an index icon in Helix RADE 6.2, and you can edit that index by dragging and dropping fields and abaci from the Element Panel into its editor window, as illustrated in this video, which, in addition to introducing two new features, shows the visual nature of Helix reborn in macOS. We took care to preserve the function of the Classic index editor, while updating the visuals for macOS. If you know how to edit an index in Classic RADE, you know how to do it in macOS RADE too. The only immediate difference is that instead of a panel affixed to the side of the index editor window, the Element Panel is seperate. In addition to replicating the old functionality, we added some great new features. The index editor is no longer constrained to its old narrow width. You can now rearrange the order of icons in the index simply by dragging them up or down. When you drag an icon into the index, the space ‘opens up’ to show you that it will be accepted. You can even drag an icon from one index to another, if it happens to be handier. Of course, in keeping with our new model, if you change your mind — or make a mistake — you can ‘Revert’ the index to its former state. Closing the index window automatically commits the changes. Last month we outlined where we expected to go for the next few months, and we are happy to report that we are still on track. Preliminary Release 16 is expected to bring the sequence editor and possibly another new interface advance. We also hope to be able to polish off a few rough edges that have been annoying us for a while, and of course, any new bugs that are reported will get immediate attention. After that, we plan to immerse ourselves in the macOS RADE template, which is probably the most important — and exciting — development since we started this journey. If you haven’t renewed your Europa Pioneer Plan membership, please contact us right away. If you have tried and failed, tell us and we’ll fix it. If you are a Helix user who has not yet joined us, and you’re waiting until the work is all done, need we remind you that we really could use your financial support? It only gets more expensive — in both time and money — not just for you, but for everyone, the longer you wait. Clamor for the View by Icon project continues to build, but financial backers are few and far between. Don’t be deterred if this feature is important to you. Letting us know you are interested in helping does not commit you to any particular dollar amount yet. We’re still building the team that will bring this vital part of Helix back. If you’re in the camp that wants this feature restored, contact Gil.